You can locate everything from your last logged in locations in Facebook to a browser using a single settings. Facebook trace locations where you are login information on any smartphone or computer. Sometime we need to logged into your friend or other family members Laptop, PC or Smartphone to do this job, and forgot to logout. Most of person worried, if someone else has check or stolen your personal information from your Facebook account. Don’t worry in this guide we have to discuss an easy way to which you can easily track your Facebook last login location and also end the sessions at once. 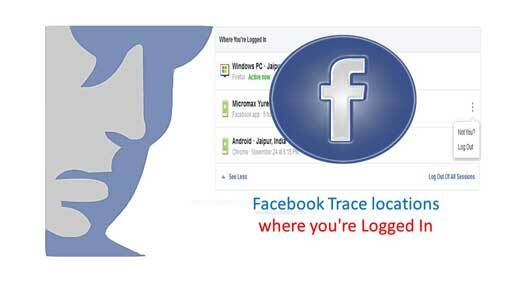 Facebook helps you to easily track all the locations where you logged in your Facebook account. You can check logged in date, time, location, device or browser used information for every login session. If you feel any device is not familiar with you, where you logged in your Facebook account then you can immediately end the session at any or all the devices. If you forgot to logout from your Facebook account at any other device or location. In that situation you must have to take given simple steps to logout your active Facebook account. Step 1: Active your Facebook account either your smartphone or personal computer. Click on the drop down arrow and choose “Settings” option in your active Facebook account. Step 2: Below the General Account Settings option click on the “Security and Login” option. Find “Where You’re Logged In” option in the Facebook security and login window . By default this feature shows current active logged in information of your Facebook account. If you want to check all previous information than click on the “See More” option. Now, you can check everything like date, time, device, browser and location information where you last time logged in. Step 4: If you found any unfamiliar device or location where you not logged in. You can choose logout option by clicking on three vertical dots to turn off your Facebook account. You can also click on the “Log Out Of All Sessions” to quickly close active Facebook account from all the devices. After login in to your Facebook account you can watch there are lot of videos are automatically running on your mobile or PC. Facebook introduced his latest automatically running videos on Facebook for his registered users. It is most important commonly topic which is asked by different users how do i stop automatically running videos on Facebook? All we known there are lot of users around the world who are daily surfing on the Facebook. Most of the users have to run multiple Facebook accounts either from his PC or Desktop or Smartphone. If they want to switch to other Facebook account they must have to logoff first account during working on Android or iPhone. Lot of person try to switch or open multiple Facebook account on Android or iPhone. If you are working on Desktop PC or Laptop then you have to open a new browser or use incognito mode to open multiple Facebook accounts on Android or iPhone.